Paul Menard will start his No. 21 Wood Brothers Racing Ford on the pole for the Advance Auto Parts Clash at Daytona (Fla.) International Speedway on Sunday after a draw for the event’s starting positions. He’ll be joined on the front row by Kyle Busch in the No. 18 Joe Gibbs Racing Toyota. Twenty drivers qualified for and will start the race as a result of being in the 2018 playoffs; winning a pole last season; being former Daytona 500 pole or race winners, provided they competed in the Monster Energy NASCAR Cup Series full-time in 2018; or winning a previous Clash, also provided they competed full-time in the series last year. Chase Elliott and Denny Hamlin will start the Clash in the back in backup cars after their involvement in a four-car crash in the event’s lone practice session Saturday. 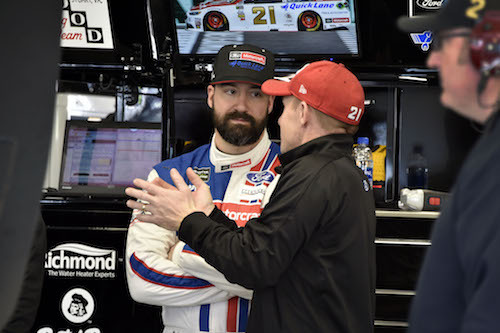 Ryan Newman and Kevin Harvick also were involved, but with their cars sustaining only minor damage, their teams are expected to make repairs to their primary cars.